Are you an app dev? Microsoft engineers are inviting you to a day’s live hands on training. The Windows 10 anniversary update was released to consumers recently. Microsoft also released the Software Development Kit (SDK) to developers. The SDK is available to developers to build Windows 10 Universal Windows Platform (UWP) applications. That’s applications that span the whole Windows 10 devices range. 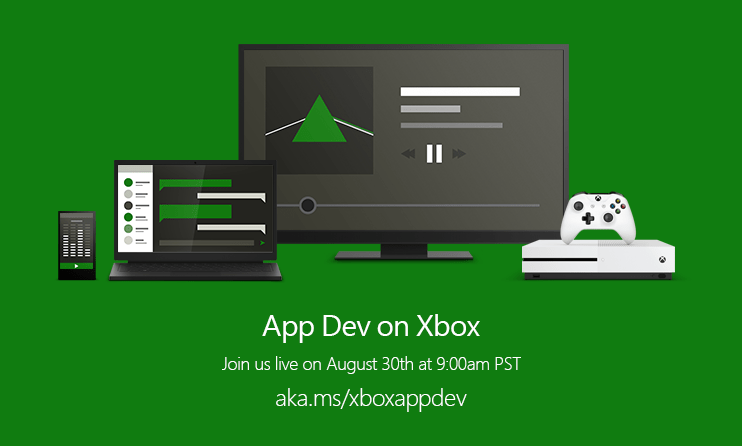 The App Dev on Xbox online event is scheduled for August 30th, 4 PM (UTC). The engineers will talk about the new features and capabilities in the SDK. There’ll also be a section to take and answer questions from viewing developers. Q and A with expert panel. Get the Windows 10 Anniversary Update Software development Kit; download the Anniversary Update SDK. Join the event on twitter using the hashtag #XboxAppDev and follow the Windows Developers on Twitter (@WindowsDev) for updates. Save the date, add the event to your calendar. Follow the event live on the 30th here. L’App Dev sur Xbox événement en ligne est prévue pour le 30 Août, 16 :00 (UTC). Les ingénieurs parleront les nouvelles fonctions et fonctionnalités dans le SDK. Il y aura aussi une section de prendre et de répondre aux questions d’afficher des développeurs. • Q&R avec groupe d’experts. Participer à l’événement sur twitter en utilisant l’hashtag #XboxAppDev et suivez les développeurs Windows sur Twitter (@WindowsDev) pour les mises à jour.